Lampwork glass beads used in this multi-strand necklace and earrings were individually handmade by lampwork artist, Sallie Licata. 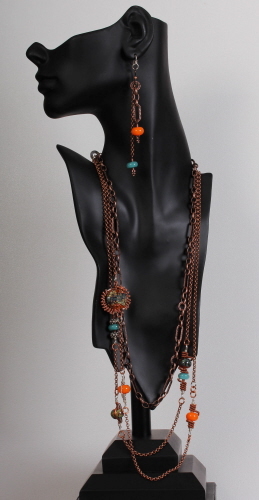 Beautiful autumn colors of burnt orange, bright orange, dusty blue, olive green and shades of brown create the focal of this jewelry set. 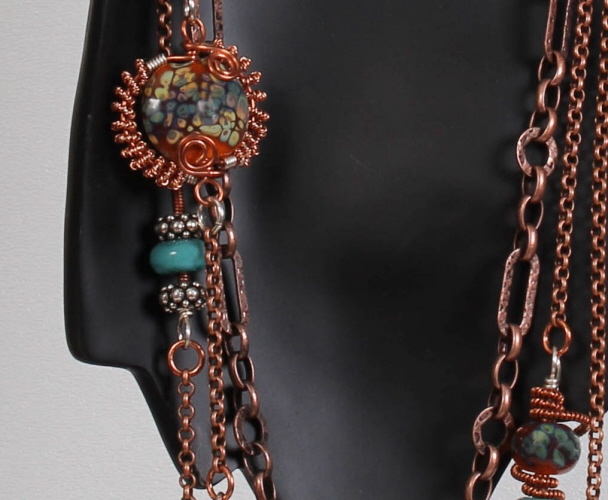 A combination of copper and sterling silver wire and spacer beads have been used to frame and accent these lampwork glass beads. Hammered steel washers are used as a design element and to add extra length, they do not show in the pictures as they are behind the neck and would only show with a short or up-do hair style. 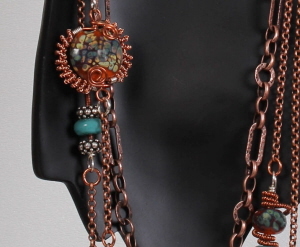 Antiqued copper plated chain, over steel or brass, finishes the design. Necklace at longest length measures 32½ inches.